Explore & Go Whale Gym is rated 4.8 out of 5 by 24. With just the right attitude, you can make every day a beach day. Your king of the sand castle can lounge inside or out with this baby gym. UV protection built into the whale canopy keeps life easy and breezy and full of shade. 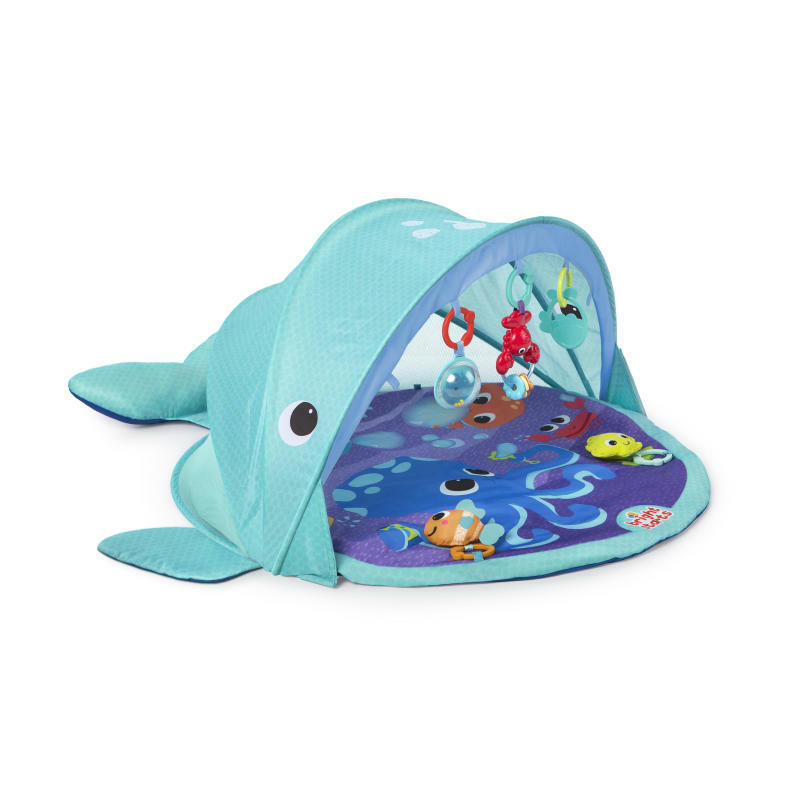 You can make a splash during playtime without worry – this sea-worthy play gym from Bright Starts is water resistant! When tummy time is on deck, detachable toys will entertain your beach bum while the removable whale tale makes the perfect prop pillow. From the living room to the yacht club, you’ll have a whale of a time wherever you are. Dimension (in) 48" x 43" x 17"
Rated 5 out of 5 by epike from Great for travel! Love the canopy for outside! I have been anxiously waiting to use this with my son since I received it last winter and it did not disappoint! The mat is great quality and the added canopy is great for time outside. I love that we can also take the mat out of the canopy for separate use. The weighted sides are a big help for keeping the mat down outside. Make sure you have scissors handy when opening it, there seemed to be lots of zip ties to get through. Other than that it was nice and easy to set up! It folds flat into a small bag making it easy for all of our travels. It’s nice to have something to take a long that doesn’t take up the whole trunk! It did take a few tries to learn to fold it, but once you get the hang of it is no problem. I would definitely recommend this mat, especially if you enjoy time outside and are always on the go! Rated 5 out of 5 by epike from Great for travel! Love the canopy for outside! I have been anxiously waiting to use this with my son since I received it last winter and it did not disappoint! The mat is great quality and the added canopy is great for time outside. I love that we can also take the mat out of the canopy for separate use. The weighted sides are a big help for keeping the mat down outside. Make sure you have scissors handy when opening it, there seemed to be lots of zip ties to get through. Other than that it was nice and easy to set up! It folds flat into a small bag making it easy for all of our travels. It's nice to have something to take a long that doesn't take up the whole trunk! It did take a few tries to learn to fold it, but once you get the hang of it is no problem. I would definitely recommend this mat, especially if you enjoy time outside and are always on the go! Rated 5 out of 5 by Jshields from PERFECT!!!!!!!!! !1 This was a gift to my grandson.. this is perfect light weight and easy to pack and take along places. It helps to keep the sun off and the light when he falls asleep playing. Rated 5 out of 5 by Dtamplin from Sooo cute!!! I love this play mat!! I think the design is adorable and very original. I am excited to use it for our new baby arriving in a couple months. I think it will bring great entertainment. I like the gender neutral colors and scheme, underwater life will never be outdated. I highly recommend this product. Rated 4 out of 5 by Nbrabec1 from A whale of a time I received this product to review and have newborn twin girls who are just getting curious of the world around them. I have placed them both in the play gym and the seem to enjoy focusing on the objects and the whale tail is a great prop up for tummy time. Rated 5 out of 5 by MamaCoe from Such a genius product! We are always on the go! This play gym is a life saver. Keeps my little happy! The pad is so soft and thick, the toys are eye catching and keep baby entertained. Having the cover to shield baby from the sun is a plus! I LOVE that I can just put the gym into the washer and let it hang dry. Good as new!